L-R Trenten Williams, President's Scholar; Dr. Christopher Blake, MGA president; and Jordan Rigdon, Academic Recognition Day Scholar. Photo by Jessica Whitley. Trenten Williams of Bonaire, a Middle Georgia State University (MGA) senior graduating with a bachelor's degree in Biology, has been chosen the President's Scholar for the Class of 2018. He was one of more than 30 MGA students recognized at the 2018 Honors Convocation for their academic achievements. 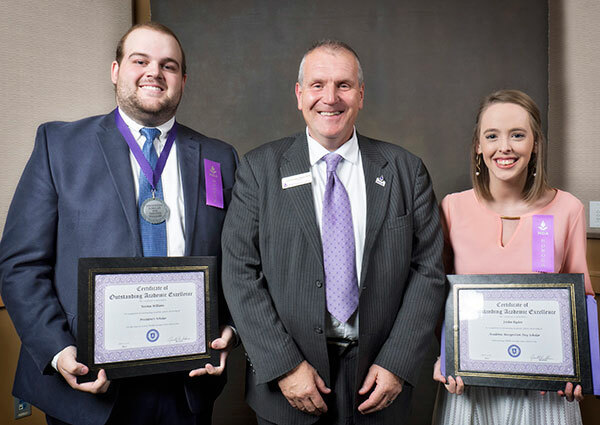 Each year, a graduating senior is chosen by MGA's Honors, Awards and Graduation Committee, with the approval of the University president, to be the President's Scholar. The chosen student must have an outstanding academic record, involvement in campus and/or community service activities, and demonstrate characteristics indicating the promise of a successful future. Williams, who plans to enroll this fall at Augusta University's dental school, will represent graduating seniors by speaking at all graduation ceremonies scheduled for May 8. Jordan Rigdon of Byron, a senior finishing up her bachelor's degree in Early Childhood Special Education, was named MGA's 2018 Academic Recognition Day Scholar. The Academic Recognition Day Scholar is chosen each year from an elite group of students who demonstrate high academic achievement and a strong commitment to service to their college and community. As MGA's Academic Recognition Day Scholar, Rigdon receives a congratulatory letter from the University System of Georgia chancellor and signed resolutions from the Georgia Senate and House of Representatives. Corey Megran: Outstanding Academic Excellence in English, B.A. Michael Williams: Outstanding Academic Excellence in History, B.A. Courtney Stepp: Outstanding Academic Excellence in Mathematics, B.S. Mazen I El-Jeaid: Outstanding Academic Excellence in Core Curriculum, A.A.
Trevor C. Pope: Outstanding Academic Excellence in Core Curriculum, A.S.
Laurel Faye: Outstanding Academic Excellence in Modern Language, A.A.
Meredith Lauren Bearden: Outstanding Academic Excellence in Studio Art, A.A.
Kyla Bayer: Academic Excellence in Interdisciplinary Studies, B.A. Kaitlyn Lingefelt: Academic Excellence in New Media and Communications, B.A. Trenten Williams: Outstanding Academic Excellence in Biology, B.S. Tony I. Clay: Academic Excellence in Air Traffic Management, A.A.S. Abigail Mae Bartow: Outstanding Academic Excellence in Business Administration, B.S. Deborah Walsh: Outstanding Academic Excellence in Teaching, M.A. Michael Parrott: Outstanding Academic Excellence in Criminal Justice, B.S. Anthony Cleator: Outstanding Academic Excellence in Psychology, B.S. Dawn Lade: Academic Excellence in Public Service, B.S. Zoye Griffin: Academic Excellence in Nursing, A.S.N. Kelsey Jackson: Outstanding Academic Excellence in Nursing, B.S.N. Richard Yoder: Outstanding Academic Excellence in Nursing, R.N.-B.S.N. Robert Brunson: Outstanding Academic Excellence in Nursing, M.S.N. Tyler Michelle Hilton: Outstanding Academic Excellence in Respiratory Therapy, A.S.
Tia S. Singleton: Outstanding Academic Excellence in Respiratory Therapy, B.S. Austin Stegar: Outstanding Academic Excellence in Information Technology, B.S. Jeremy Walker: Outstanding Academic Excellence in Information Technology, M.S.